The island’s Māori history dates back more than 850 years to Kupe and continues to Ngāti Toa Rangatira from the 1820’s. European history began with whalers in the 1800’s followed by farmers, including John Bell and the Vella family. It is now a scientific reserve, under the Dept of Conservation. Mana Island woolshed. John Goult’s Farm 1969. The original name of Mana Island is Te Mana o Kupe ki te Moana Nui a Kiwa, which means “The mana of Kupe in crossing the great ocean of Kiwa”. The island is also known as Te Mana o Kupe ki Aotearoa, Table Island and Warspite Island. Mana Island is approximately 2.5 kilometres long and 1.2 kilometres wide and covers an area of 217 hectares with coastal cliffs rising to 121 metres above sea level. Māori legend tells of a taniwha Te Awarua o Porirua who lives in Porirua Harbour and was the cause of Mana Island’s distinct shape. Long ago Awarua longed to join his friends the birds, as they flew across the sky, so he decided to teach himself to fly. With the birds cheering him on Awarua raced from one end of the harbour to the other and eventually felt himself lifting into the air. As he attempted to gain height he crashed into the slopes of Whitireia. On his second flight he soared over Titahi Bay cheered on by his friends the birds. Once again he failed to gain adequate height and struck Mana Island, skimming the top of the island level as he ploughed along on his clumsy landing thus leaving the flattened top of the island as we know it today. It is said that Kupe, the legendary navigator landed on Mana Island and climbed to the highest point of the Island and bestowed the name Matakitaki – lookout point. It is thought that Kupe left his daughter Mohuia and possibly his wife Hine te Aparangi on the island. Prior to 1800 Ngāti Tara and Ngāti Ira lived around the Porirua shore and on Mana Island. Other iwi said to have at times resided in the area include Muaupoko, Rangitane,Ngāti Apa , Ngāti Kahunguna and Ngāti Hotu. Before them, earlier unknown iwi lived in this location, leaving evidence of their stay in middens and evacuated sites. The Ngāti Ira suffered heavy losses following the raid by the musket – armed northern tribe of Nga Puhi. In the early 1820’s, facing continued warfare against the newly arrived Ngāti Toa Rangatira, they moved to the Wairarapa and to the South Island. Sometime after Ngāti Toa Rangatira arrived in the area around 1822- 23, Te Rangihaeata and his mother Waitohi made their home on Mana Island. Te Rangihaeata built a carved house on Mana Island and named it Kaitangata. Inside the Kaitangata house was an elaborately carved figure representing Te Rangihaeata. Waitohi died in 1839 and was buried on the island. In 1843, cautious of the government response to a recent confrontation, Te Rangihaeata left Mana Island and never returned. Te Rauparaha also built a whare and lived on the island intermittently, preferring Kapiti Island as his main base. The Treaty of Waitangi was taken to Mana Island for the chiefs to sign. Te Rangihaeata was on the island at the time and signed the treaty with Te Rauparaha. The first occupation of the island by Europeans was in the 1830s when a whaling station was established. In March 1832 three Sydney merchants, John Bell, Archibald Mossman and Alexander Davidson, acquired Mana Island from local chiefs, for the purpose of farming. The merchants saw the arrangement as permanent and binding, whereas the three Ngāti Toa Rangatira leaders saw it as temporary granting of the use of the land. Bell purchased Davidson’s third share of Mana Island in 1936. A year later a share in the ownership of the island was purchased by Frederick Peterson who sent the Fraser brothers to Mana from Sydney. Alex and Thomas were identical twins and whalers, coopers and shipwrights by trade. The Mana Island Station often worked together with the shore whaling station of Te Korohiwa , known as Coalheavers, just south of Titahi Bay. The whalers had a reputation as a lawless lot, distrusting each other and spreading rumours to support their villainy. The Fraser brothers were still operating with two whale boats in 1844 and lodged a claim for the island in 1850. The island became crown property in 1865 and was subsequently leased to J.F.E. Wright of Wellington in 1873. The Mana island lighthouse, built at the northern end of the island started operation in 1864 and was discontinued in 1877. It was relocated to Cape Egmont in 1881 where it remains today. In 1895 the island was subleased to Mariana Vella, however a 10 acre portion of the land south eastern shore of the island was excluded from the lease to be used a land reserve. Mariana Vella later transferred the lease to his sons who farmed the island until 1953. In the same year the lease was transferred to I M Gault, a Wellington solicitor for a term of 999 years. His son, John, managed the farm which had some 1,300 sheep and 100 cattle at the time. In 1971 this lease was terminated and the management of the island transferred to the Government . 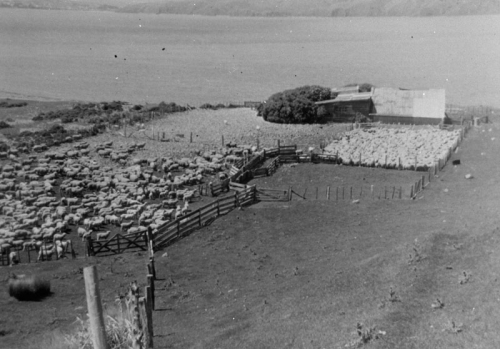 Wool from Mana Island sheep was among the earliest exported from New Zealand. The woolshed from this era still stands at Shingle Point and now has displays explaining the history and features of the island. In recent times , the island has been used for various purposes, including an exotic sheep quarantine and breeding station in 1973 managed by the Ministry of Agriculture and Fisheries, and a temporary cattle farming operation managed by the Department of Lands and Survey. Mana Island became a Scientific Reserve in 1987, and since that time has been managed and administered by the Department of Conservation. Various replanting and animal release schemes have been undertaken on the Island under DOC management, including the release of Little Spotted Kiwi and Green Gecko and planting of native trees.